Mia Farrow fears for her future in Rosemary's Baby. 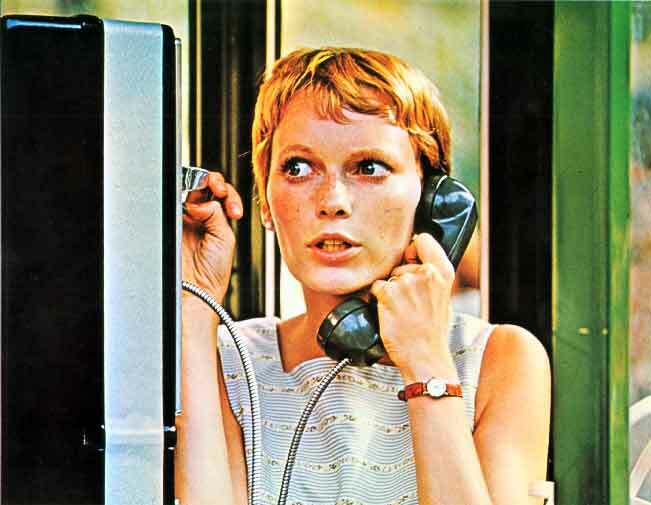 Roman Polanski’s (Carnage) masterful Rosemary’s Baby (1968) remains one of the filmmaker’s finest works and one of the greatest horror-thriller films of the past half-century. Young Mia Farrow (The Last Unicorn) stars as young mother-to-be Rosemary Woodhouse, a newly married New Yorker (by way of Nebraska) who grows increasingly suspicious that her over-friendly elderly neighbors (High Society’s Sidney Blackmer and Harold and Maude’s Ruth Gordon) and self-involved actor-husband (John Cassavetes, Too Late Blues) are hatching a Satanic plot against her and her unborn baby. Increasingly terrifying and darkly comic, Rosemary’s Baby was faithfully adapted from Ira Levin ’s best seller by writer/director Polanski. It regularly pops up on “Top Ten Horror Movie lists,” as it rightfully should, including a couple of ours — Big Bad Daddies for Father’s Day and 31 Scariest Movie Moments for Halloween!